A rendering of Entheon, the next incarnation of CoSM. 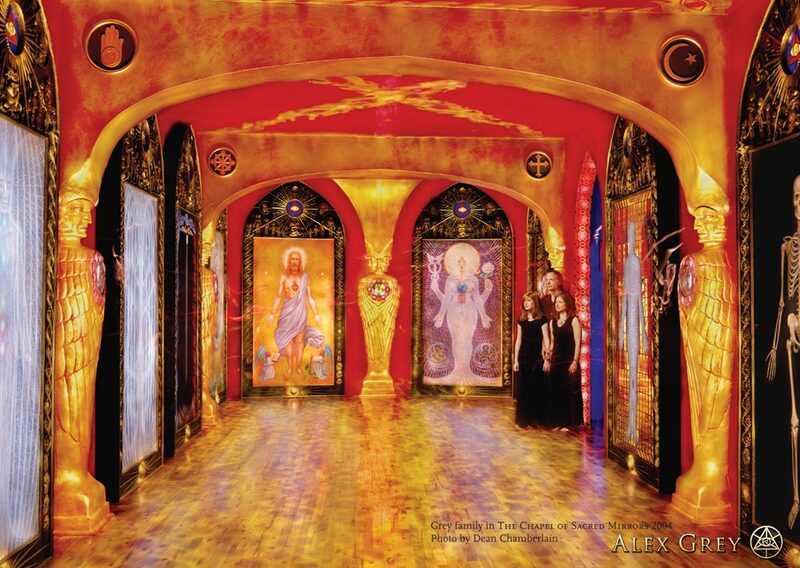 The Chapel of Sacred Mirrors (CoSM) in Wappinger, New York, is many things – visionary art gallery, church, educational site, and cultural event venue. 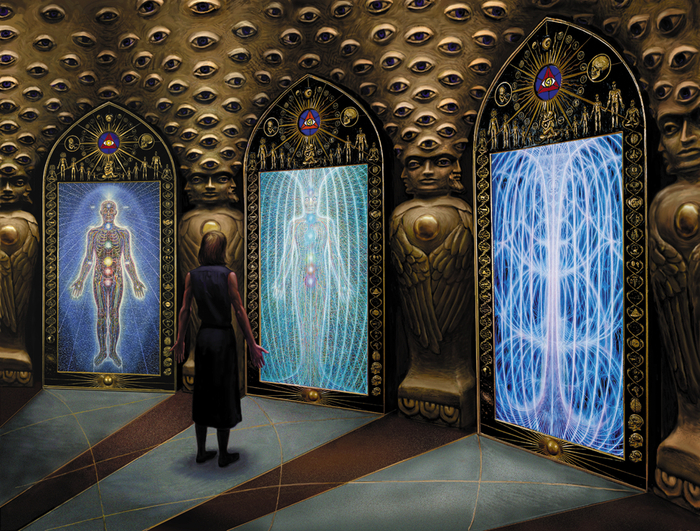 It was borne from Alex Grey’s opus of paintings and sculptures called Sacred Mirrors, which depict human multidimensionality and are designed to catalyze a direct experience with one’s innate divinity. These incredible works of art are not only transforming their viewers, they are also transforming the space that houses them, and helping to catalyze the birth of an amazing cultural community center. 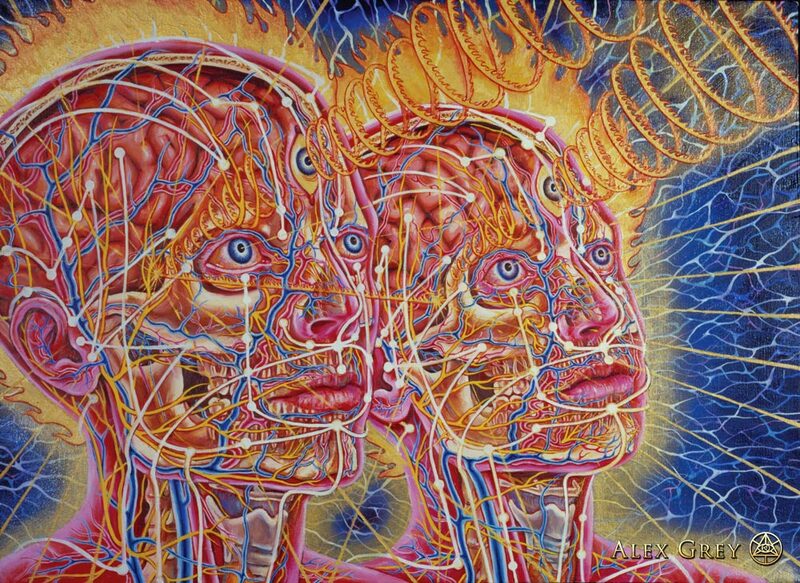 New Man New Woman, Alex Grey 1984. Alex Grey stands at the pinnacle of the visionary art world, his works more widely known and recognized than any other artist in the genre. His artwork is iconic and stunning, with an uncanny ability to convey esoteric understandings and visceral impressions at a glance. As other great artists, there is no need to explain his paintings and no guessing at which pieces are his – Alex’s powerful style jumps off the canvas and conveys his spiritual visions in minute detail. Chaos Order & Secret Writing #1, Allyson Grey 1998. 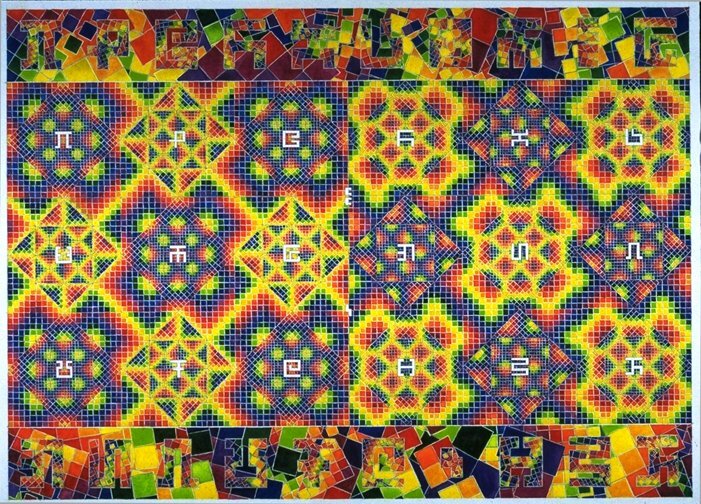 Allyson Grey, Alex’s wife and creative partner for over 25 years, is an accomplished visionary artist as well, with brilliantly detailed geometric paintings that include layers of code, color, and form. Together they are responsible for a huge body of acclaimed visionary artwork, not to mention the emergence of the genre itself into popular awareness. The Greys in the Chapel of Sacred Mirrors, 2004. CoSM began as a temple-like gallery space in New York City in 2004, housing the Sacred Mirrors in a fully immersive environment. 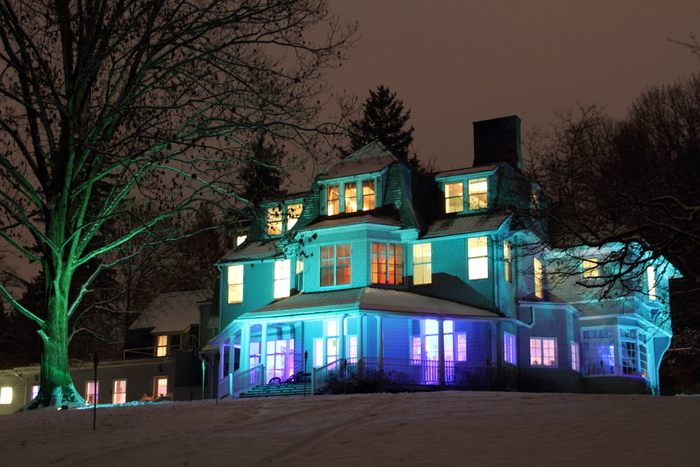 Eventually Alex and Allyson decided to move to a more permanent location, and in 2009 CoSM relocated to a 40-acre rural property north of New York. It enjoys official recognition as a church and throughout its history it has hosted full moon celebrations, musical performances, ecstatic dances, educational workshops, and even visionary permaculture design courses. As a spiritual center that spreads eco-awareness and fosters community empowerment, it has become much more than its seed artwork. The next incarnation of the Sacred Mirrors’ home on the CoSM grounds will be an elaborate free-standing temple called Entheon, which is set to begin building in the next few years. Entheon will be an example of visionary architecture, a temple akin to the sacred sites of ancient cultures, where every meter will be designed to elicit a visionary experience. People were so excited for this project, the Entheon Kickstarter campaign raised over $200,000, becoming the second most funded art project in Kickstarter history. If days and nights filled with workshops, visionary art, music, and ecstatic dance sound familiar, you’ll recognize that CoSM has much in common with Burning Man and other transformative gatherings. As a community center, CoSM exemplifies many of the principles and practices of these festivals, giving visitors a chance to both discover themselves and explore new realities through education, art, and ceremony. 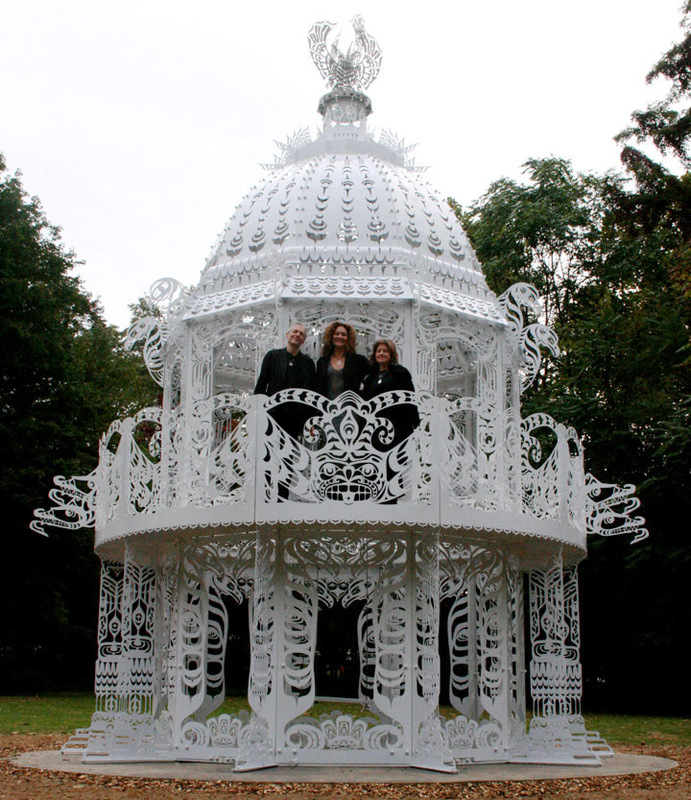 You may also notice a familiar sight gracing the grounds: Kate Raudenbush’s white steel sculpture “Altered States,” which debuted at Burning Man in 2008 and is now on display at CoSM. It’s no surprise that Alex and Allyson are repeat visitors to the playa themselves, often bringing amazing art and doing live presentations and paintings. Luckily for us, CoSM is not just a temporary environment, but a permanent one. As a site to display, create, and celebrate visionary art, CoSM is a profoundly important space, and the creation of Entheon will multiply that even further. But as a community – serving as a nexus point for education, eco-consciousness, and creative collaboration – it transcends the world of art and becomes a model community for a regenerative future. Imagine a world with creativity-focused eco-villages in every city! Perhaps that is a key aspect in achieving the long sought-after goal of bringing the playa home: rooting it permanently throughout the planet in communities like these. There is only one Alex Grey, but CoSM serves as a template that we can all follow for how creative arts can act as a catalyst for a holistically epic community center. And beyond even that, the building of Entheon and CoSM’s recognition as a church serve to also revolutionize our idea of what a church, religion, or spiritual community center can be.